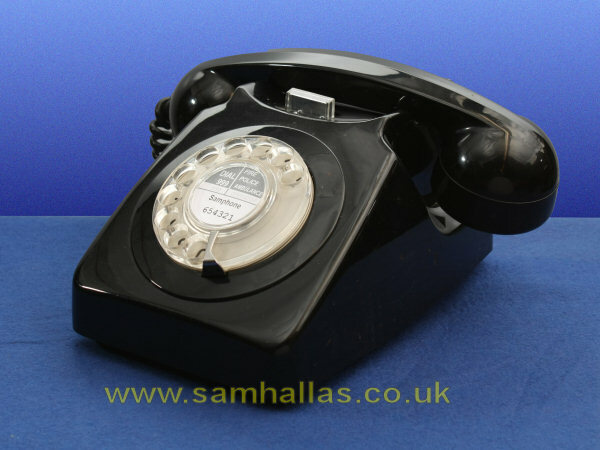 Although some telephones were moulded with other plastics all of the ones on show here are made in ABS (Acrylonitrile butadiene styrene) - see Wikipedia for information. 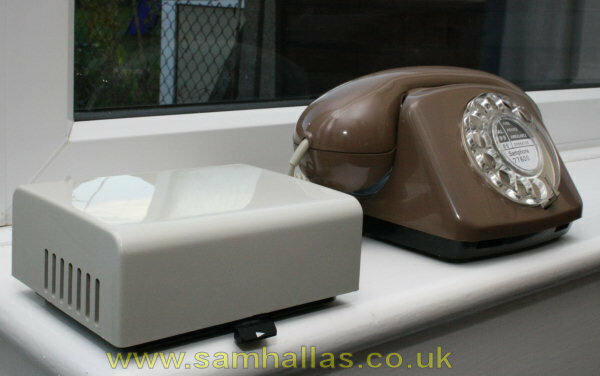 Like Bakelite it moulds cleanly and has a glossy finish. Although still brittle, it is much more flexible than Bakelite, is cheaper to mould, not needing high pressures, can be readily coloured, drilled or machined. However, it is a thermoplastic, so Mr Engineer, keep your soldering iron away from the case! 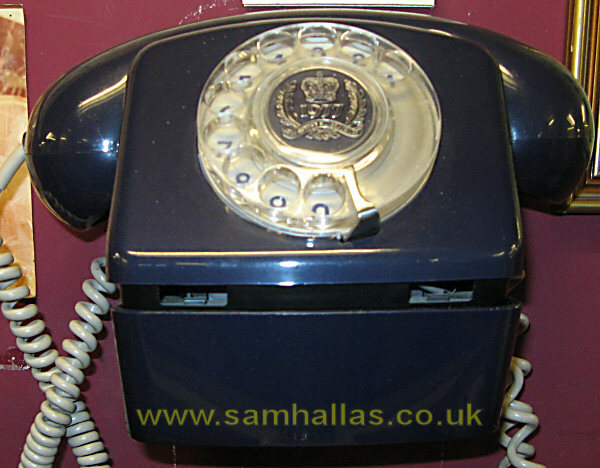 Telephone number 706 replaced the 332 as the Post Office's standard instrument from 1959. Later models were fitted with the carrying handle across the cradle rest (right). 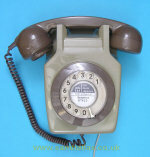 The first BPO phone to have a regulator to adjust the receive volume on short lines. A range of colours was readily available: black, blue (as on the left), two-tone green, two-tone grey, ivory, red and yellow. The model on the left has a dial finger plate coloured to match the body. Later ones were fitted with the clear dial (right). Telephone No 706 is the subject of one of my 'Take a Phone to Bits' articles. 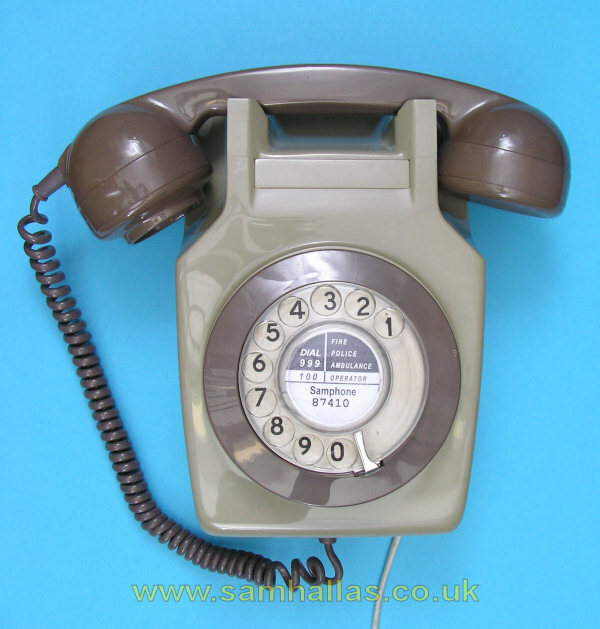 The same circuitry as the 706 but Telephone number 746 was a cost reduced version with a restyled case. 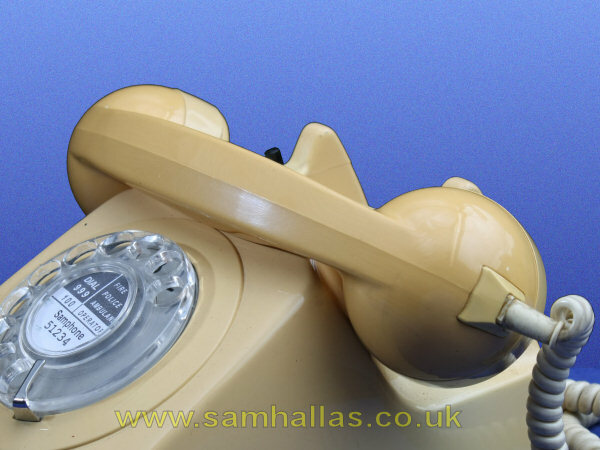 The handset can be parked in the off hook position as shown on the right. The same range of colours was available as for the 706. The black colour was not very popular with domestic subscribers and found itself mostly in business use. Ivory and two-tone grey were most popular for home use. At the very end of production after telephone instruments were liberalised a range of exotic colours, such as tangerine, were made available. The bad fading of the ivory model on the right is a telling example of what happens to plastic with age - but see what a difference the Retr0bright process made. 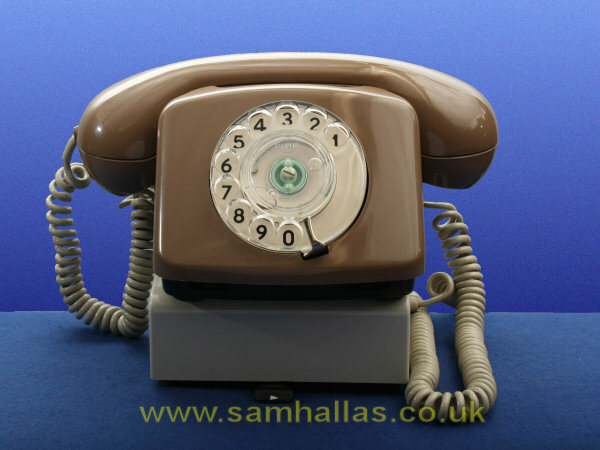 Telephone No 746 is the subject of one of my 'Take a Phone to Bits' articles. Using the same circuit board as the 746 above but with a modified chassis, Telephone No 741 is the wall-mounted version of the Telephone 746. 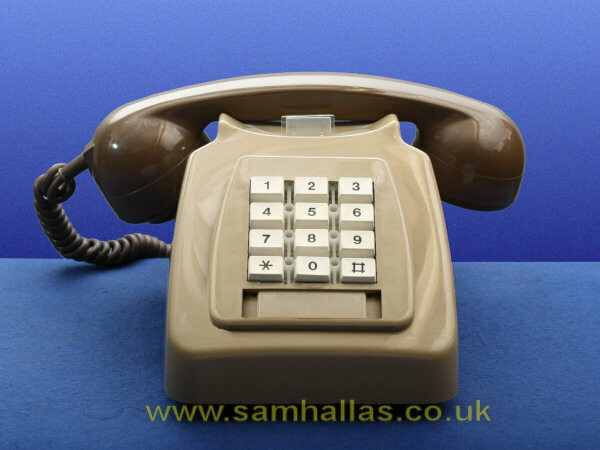 The rectangular panel below the handset can be removed to mount one or two press buttons. 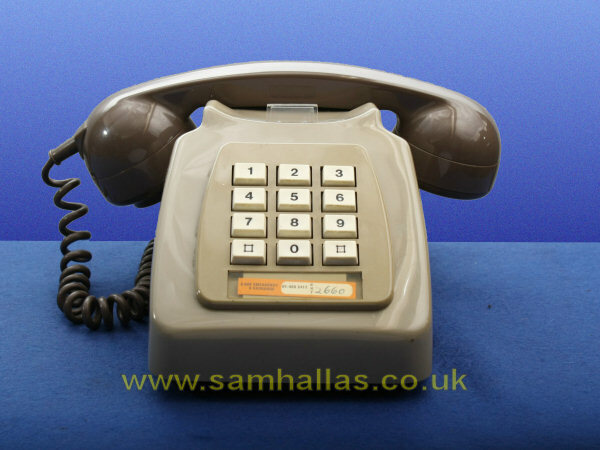 This particular phone is the later 8741 with the high impedance bells and wired for plug and socket working. The handset also has the earpiece 29A with the smaller holes and is fitted with a transmitter inset No 21A, the electret version. 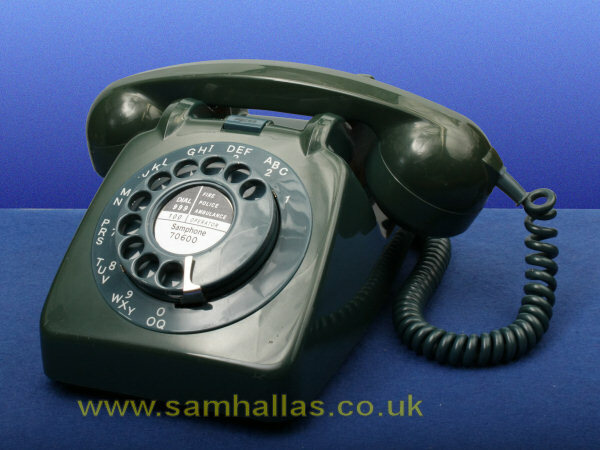 Telephone No 741 is the subject of one of my 'Take a Phone to Bits' articles. I do not believe the BPO ever used the 746 telephone in a magneto version, but it was used widely by the railway for point-to-point circuits. 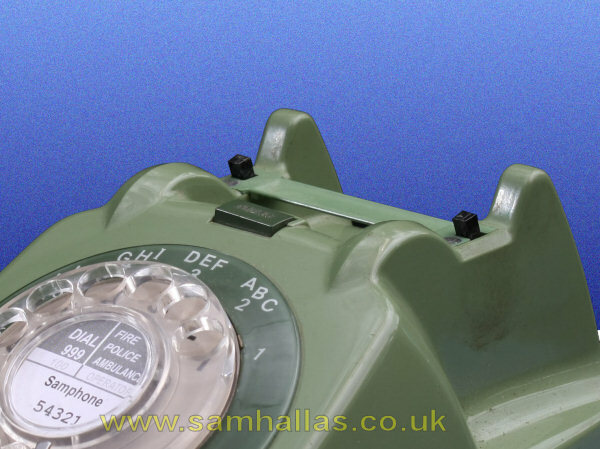 It contains a transistorised ringing generator, simlar to the one in the lineman's test telephone, No 704. See this picture for a view of the insides. 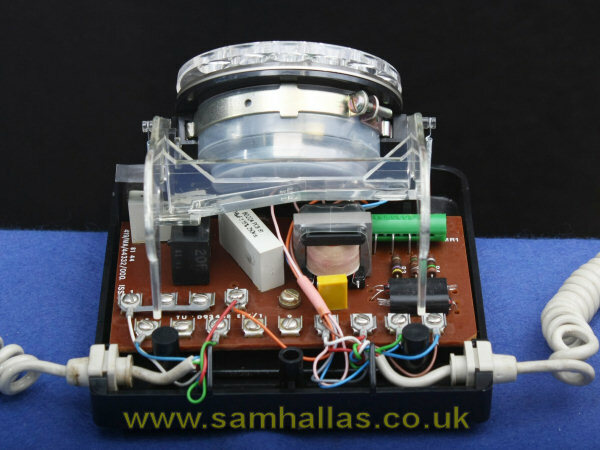 A separate 6 volt battery or power supply was required to supply speech battery and to power the ringing generator. Telephone SA 4258 is basically a telephone 746 modified for Dual Tone Multi-Frequency (DTMF) working. The keypad and tone circuitry mounted on a special bracket which fits the holes normally used to fix the dial. Introduced from 1969 for PABX use, since the public network at that time did not support DTMF. This is why it has an SA (special apparatus) number rather than one in the 700 series. 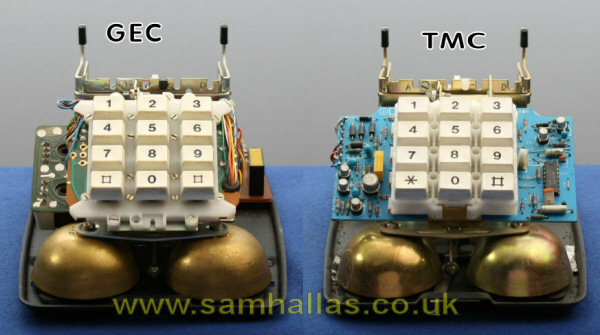 The GEC model (left) and the TMC model (right) are superficially identical until you see them with the lid off. 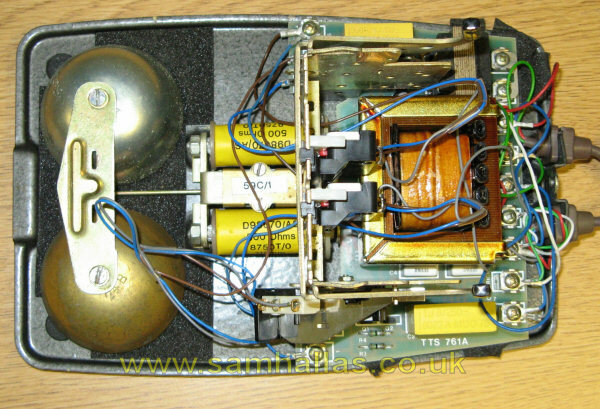 The GEC model (dated 1974) uses tuned inductors to generate the tones. The TMC model uses an integrated circuit. Not actually plastic, since the case is pressed steel, but from the same era is the Loudspeaking Telephone No 4. By no means the first loudspeaking telephone from the Post Office, but probably the first to use voice switching to avoid feedback (howling). Its metal case makes it rather heavy. 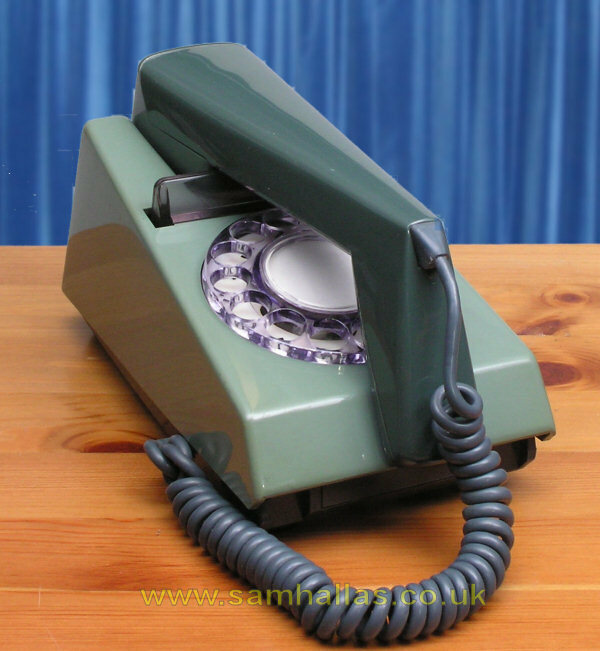 Intended for executive desks, and when privacy was needed a handset mounted at the rear could be picked up which cut out the loudspeaking feature. 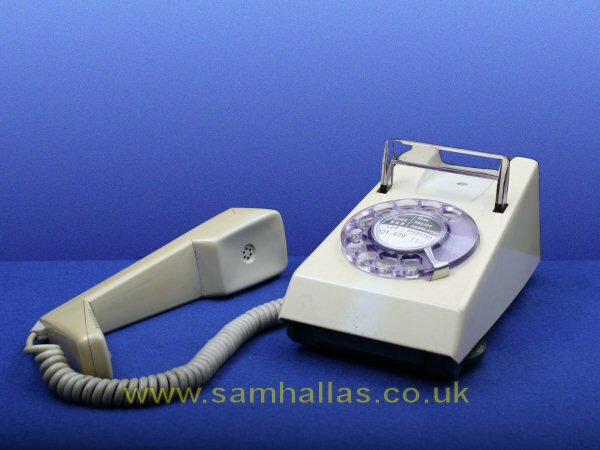 The trimphone, Telephone number 722, was a radical departure in style for the Post Office, with its fore and aft handset placing and neat styling. The first standard British telephone to use a tone sounder, with volume adjustable by a wheel on the right from quiet to loud or crescendo. The works were hardly miniaturised at all and appear to be a real shoe-horn of a job to get in the case. The dial model was so light it tended to skid around while the dial was being wound up. The later push-button version (right) did not suffer from this problem. Another novel feature was the microphone, which was mounted just below the receiver and fed by a sort of speaking tube arrangement from the mouthpiece at the base of the handset. When the telephone is off-hook, the cradle rest forms a convenient carrying handle for the telephone. 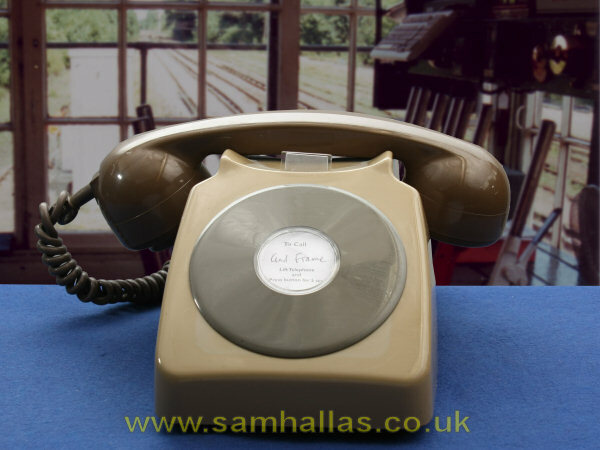 The Trimphone is the subject of one of my 'Take a Phone to Bits' articles. 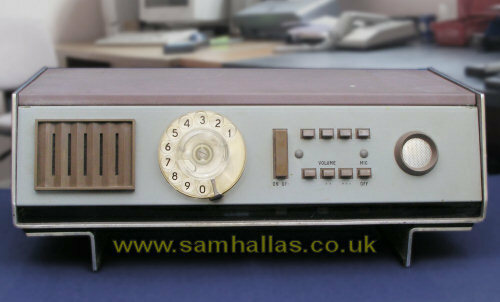 A late BT model from 1982. The compact phone, Telephone number 776, is rather similar to this Jubilee Model I photographed at Milton Keynes Museum. The 776 was originally released in 1977 but both of these are dated 1982. Only the transmission elements are contained within the case; there is no internal sounder. A separate bell unit was used. The narrow front-to-back footprint made it suitable for narrow shelves as seen here - hence the title compact.With an alternative cover the bell unit forms a shelf to stand the phone on, as seen on the right. 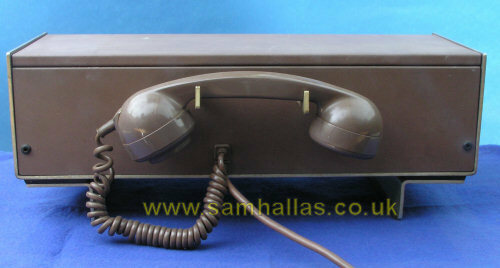 The cords come out of the sides of the telephone towards the back - handset on the left and line cord on the right. 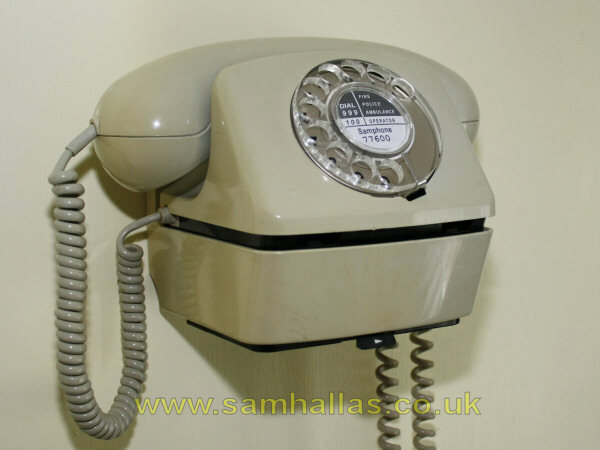 The line cord is quite long and coiled allowing the user to walk around with the telephone. The bell unit cunningly allows the line cord to exit from either the side or the bottom to cater for the two different mounting arrangements.